"I loved The Killing Joke...It's my favorite. It's the first comic I've ever loved." Alan Moore is perhaps the most acclaimed writer in the graphic story medium, having garnered countless awards for works such as WATCHMEN, V FOR VENDETTA, From Hell, Miracleman and SWAMP THING. He is also the mastermind behind the America's Best Comics line, through which he has created (along with many talented illustrators) THE LEAGUE OF EXTRAORDINARY GENTLEMEN, PROMETHEA, TOM STRONG, TOMORROW STORIES and TOP 10. As one of the medium's most important innovators since the early 1980s, Moore has influenced an entire generation of comics creators, and his work continues to inspire an ever-growing audience. Moore resides in central England. After making his professional debut in 1975, artist Brian Bolland perfected his clean-line style and meticulous attention to detail on a series of popular strips for the British comics magazine 2000 AD, most notably its signature feature Judge Dredd. 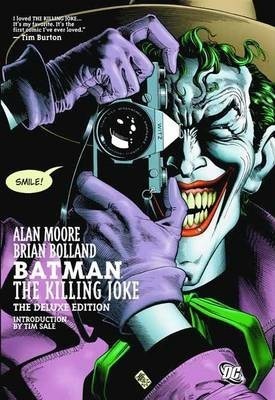 He went on to illustrate the 12-issue maxiseries CAMELOT 3000 and the Alan Moore-written graphic novel BATMAN: THE KILLING JOKE for DC before shifting his focus to work almost exclusively on cover illustrations. Since then, he has earned a reputation as one of the best cover artists in the industry, and his elegantly composed and beautifully rendered pieces have graced a host of titles, including ANIMAL MAN, BATMAN, THE FLASH, THE INVISIBLES, WONDER WOMAN and many more.